There isn't much that can't be explained by Shakespeare. A recent study from the USC Annenberg School of Communication and Journalism on the views of nearly 400 chief communications officers (CCOs) in the U.S. demonstrates they have (at last?) fully realized the worth of the social web in helping with at least two of their core responsibilities — participation and context creation — as well as what is to my mind something of a surprise — storytelling. Having initially ceded the social web to their marketing colleagues, CCOs have started to take back things on social which legitimately belong to them. Responsibility for social media participation and monitoring ranks among the top five core responsibility of CCOs today, following media relations, and reputation and crisis management. The fact that social media measurement is further down the scale likely speaks more to continued confusion about what and how to measure it, or the fact that most social programs are run out of marketing teams, than to its perceived value in tracking organizational reputation. 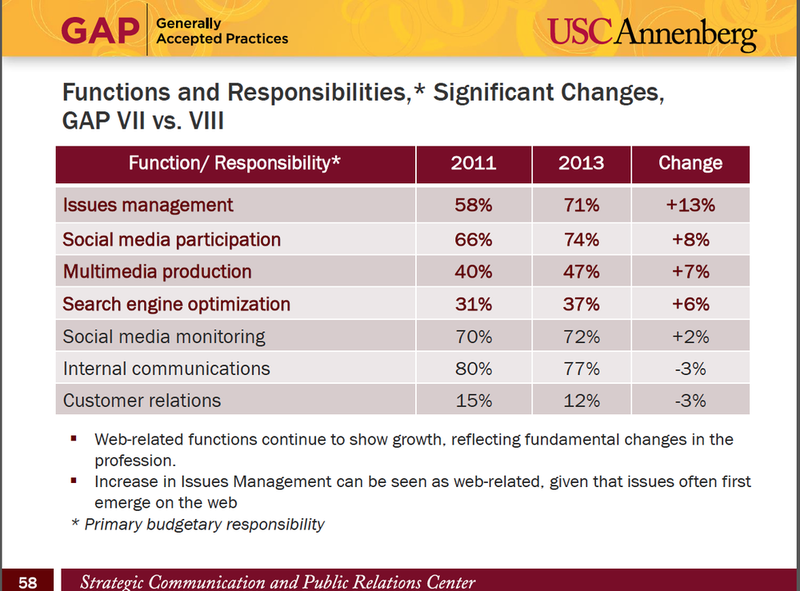 As this slide in the study concludes, demonstrating fine academic restraint, "Web-related functions continue to show growth, reflecting fundamental changes in the profession." Of those web-related functions, I take 'social media participation' to include engaging in and managing conversations with the public (confirmed later in the study), a responsibility that in the past was either not done of mediated by stakeholder engagement teams where they existed. The social web makes conversation possible, and with conversation can come stronger reputation, improved crisis communications outcomes and higher quality issue management. Context is about providing the narrative frame within which to view reported events or factual information. Establishing context — which requires story and depth — was assumed for the longest time (in Internet terms anyway) not to be something the social web was good at. Well if it ever wasn't, it is certainly no longer the case in the minds of CCOs. The social web is the go to place for context making. The best way of setting context is through storytelling. Not surprisingly, then, 71.5 % of respondents have used narrative storytelling techniques in the past 12 months I assume as part of establishing context, but certainly for trust building and influencing positive affective behaviours. 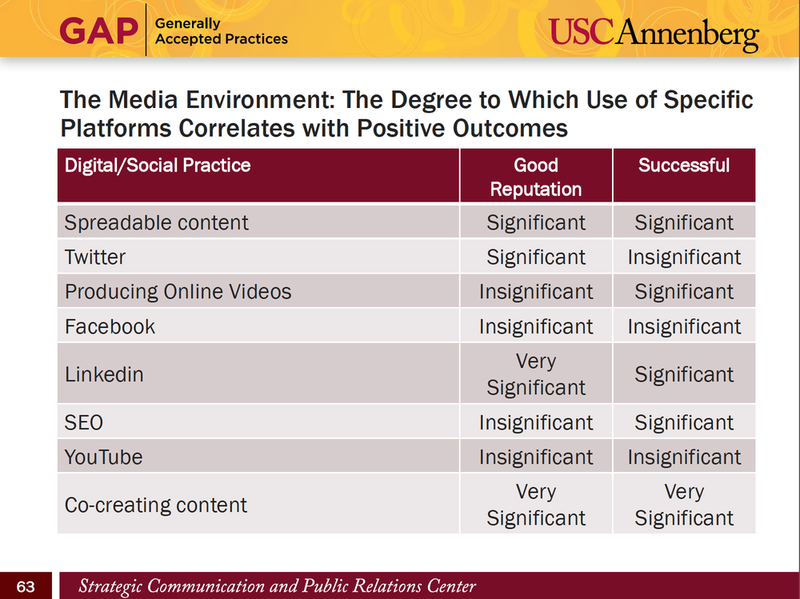 And Which Social Platforms win in the Positive Outcomes Sweepstakes? So which 'platforms' win? Number one, two and three . . . co-creation of content (with media partners? ), Linkedin and "spreadable content". All makes sense to me. Now CCOs just have to put a few more resources behind storytelling, context building and the creation of quality, spreadable content.